I absolutely adore this question for Top Ten Tuesday, so I couldn't resist joining in this week. In line with Travel Tales, I've chosen the books I've read since I started my blog that I (a) absolutely love and (b) feature traveling or places that I would like to travel to. Oh my goodness! I've only read two from this list! My Life Next Door and Jellicoe Road! But a bunch of them are on my to-read list! I adored The Statistical Probability of Love at First Sight. It was so great! I love your list. I'm not a huge YA Contemporary fan, and you clearly are,but I have to say that you picked some of the best of the best! I don't read many of books in that genre very often. I tried listening to Anna and the French Kiss, but I couldn't do it and I stopped after listening to 1 cd, not my type of book. I have heard many great things about a lot of the books on your list. *sigh* My Life Next Door......I will never stop loving that book! YES to all of the above, except the two I haven't read, but I'm running off now to look them up byeeeeee! Only 3 of those books that I haven't read yet but I remember reading your reviews for all of them. It is so cool to look back at all the books you've read since blogging and seeing all different types of them! lots of good choices and books that I need to read stil! AHHHHHH! 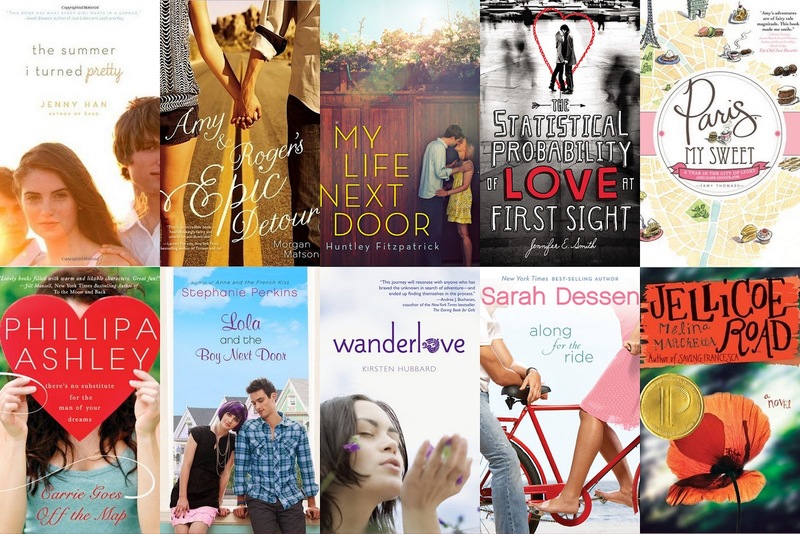 YES TO ALL THESE BOOKS! I haven't read Carrie Goes Off The Map, but I like how the author's name is larger than the title, lol. Awesome list, Alexa! I think I heard about Paris, My Sweet from you and I haven't heard of Carrie Goes Off the Map. I'm off to check them out! Wow I am SO Honoured that Carrie Goes off th Map made this list.